Want an accredited high school diploma for your homeschooler? Have you imagined that moment? The moment when the Pomp and Circumstance march plays loud overhead and reality hits you like a brick wall. The doors open and all eyes are focused on your baby boy or baby girl, all gussied up in their cap and gown, as they march down the aisle. They entered the room as your prime pupil whom you spearheaded their education, but from this point forward, your role in their education will shift as they move to the next chapter of life. Aside from feeling like your guts have just been ripped out because your baby is growing up, you want to feel good about this moment. You want to feel like you’ve had all of your ducks in a row so to speak. Every ‘t’ has been crossed and every ‘I’ has been dotted. You did your best and now your little homeschooled darling is the beneficiary. 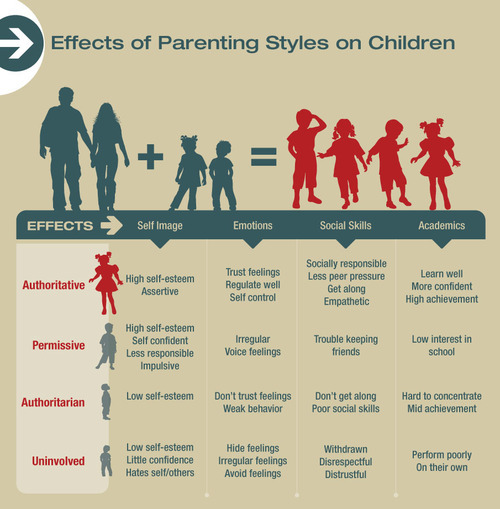 In homeschooling, there are always a myriad of options, and many of them are based on pure preference. The bottom line is that I am an avid, almost borderline psycho researcher. The purpose behind my sharing is to justify my craziness by saying that I help others as well as my little party of five. As with anything in life, it is important to have a plan and work the plan. You should be mindful of your education goals for your children from the beginning, of course allowing flexibility for the Lord’s leading along the way. As your student approaches high school or maybe they are already in high school, you may want to consider your options regarding their diploma. A homeschool parent has every right to create their child’s transcript based on work completed and submit that when they apply for college. I know families who have done this and it has worked fine for them. They took standardized tests such as the ACT or the SAT and they experienced a smooth transition to colleges, such as Texas A & M University. So, by no means should you feel obligated to pursue anything else. However, if the idea of flying solo on such a major milestone seems scary, then listen up and your family may benefit from choosing the same option as our family. My quick synopsis of the situation is that in the arena of accredited high school diplomas there are more options than you can envision. We have tried many and researched even more. One option is an online high school that you enroll in and you must use their entire curriculum and the delivery of that curriculum may not be the best. It may be costly and the options for curriculum from a Christian Worldview in a highly engaging format are certainly few if they exist at all. There are also programs like Veritas’ Scholars program that allows you to do a certain number of classes on your own with curriculum approved by Veritas, but you must also take a certain number of required courses through Veritas Press online. Their live online courses, not self-paced, average around $700 per course. In some cases, this is more costly than a college course at an online Christian University. If it is in your budget, then they certainly offer a fine education. Finally, there is this little jewel of a place that I found called Central Christian Academy out of Winterpark, Florida. Central Christian Academy (CCA) is an accredited member of the Florida Council of Private Schools since 1995. Central Christian Academy offers two main programs. One is where you purchase curriculum through them that has already been pre-approved, or they also offer a program where you can select the curriculum of your choice and submit it to them for pre-approval. I absolutely LOVE the fact that I can choose my favorite curriculum and all I have to do is send them an email with my plan and they email me back approval. It is very easy submitting your work and tests to them. They have been a pleasure to work with and I have found no other program that offers the same credibility and flexibility. For students in high school, they charge $365 per year to keep your child’s official records. It is less for lower grades, but we didn’t feel it was necessary to use such a service for the lower grades. Also, if you refer a friend, then they will credit your family $100. If you would like to sign up for next fall, please use the referral form that I have added to the files section of our Facebook group or you can email me and I will be happy to send it to you. Since my husband is in full-time ministry now, this will be a blessing to our family and I greatly appreciate it! Then feel free to modify this form and pass it on to your friends so you can earn $100 towards your child’s enrollment. Are you putting ‘clean’ food in toxic cookware? Have you been trying to eat healthier…or maybe even convert to organic? Have you heard so much about the toxicity of food that it seems the only safe thing to eat is from your own garden or farm? Well, this post is to let you know that not only is it important what you eat, but you need to consider the actual cookware you are using to prepare your food. In other words, putting your ‘clean’ food in a dirty, toxic pot is defeating the purpose of your efforts. Our journey to be healthier and more conscious about what we ingest began a few years ago. From food to household cleaners and even personal hygiene items, EVERYTHING in our household came under review. However, it never dawned on me to evaluate our cookware. I tend to gravitate to shoes and not cookware, so most of our cookware dated back to when my husband and I first married 18 years ago or maybe even from my college days. So, I’m not sure what prompted my research about six months ago, but I was not a happy camper when I discovered all of the toxic chemicals the cookware that I was using contained. It felt like my efforts to find the best deals on the healthiest foods for the past few years had been a waste. I am not interested in cancer causing, hormone affecting chemicals being leached into my family’s food. It must not be a surface that everything sticks to. It must not chip or damage easily. If this post peaks your interest, feel free to scan the web for more research. There are other non-toxic options out there. The other two that I strongly considered before my purchase were Le Creuset coated cast iron and Ceramcor. Le Creuset states that it is dishwasher safe, but it is not recommended. It will fade the color of the pot and the cost of one pot in this collection is more than what I spent on my entire set. Le Creuset is also EXTREMELY heavy. I actually tried an Xtrema Ceramcor saucepot that I bought on a Black Friday deal, but the lid chipped the first day that I used it and it took a very long time to heat up. It did retain its temperature, but it was a noticeable difference in cooking time. My final choice was a product that you probably remember from the 1980s, called Visions by Corning. 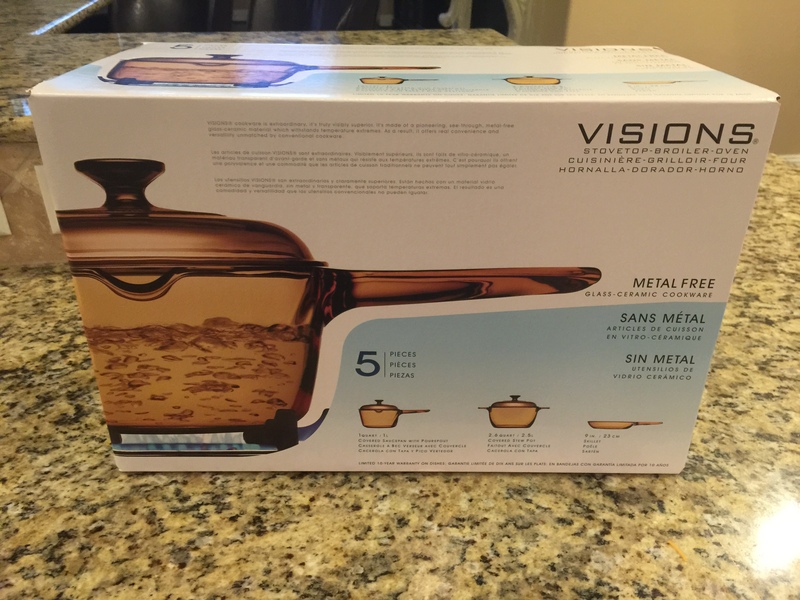 Based on my web searches, many said that Visions Cookware was no longer being produced, but I was thrilled when I found it brand new at this website, https://www.shopworldkitchen.com. They also had a buy 2 save 40% off offer on all Vision pieces, plus I signed up to receive their email newsletter and they instantly emailed me a promo code that you can stack on top of the current sale. I just checked today and they still have this promotion going on as of now. Plastic, aluminum, Teflon and the list goes on….these are things that you really do not want in your kitchen. Most glass is very safe and Pyrex is a very good option for bakeware. Also, Hartstone Pottery makes cookie sheets and muffin pans that are somewhat heavy but are dishwasher safe, which is rare for baking stones. You can purchase these from Bed, Bath & Beyond and use their famous 20% off coupons. Some silicone is safe, but it has to be the right kind of silicone and I’m not sure how you can prove that. 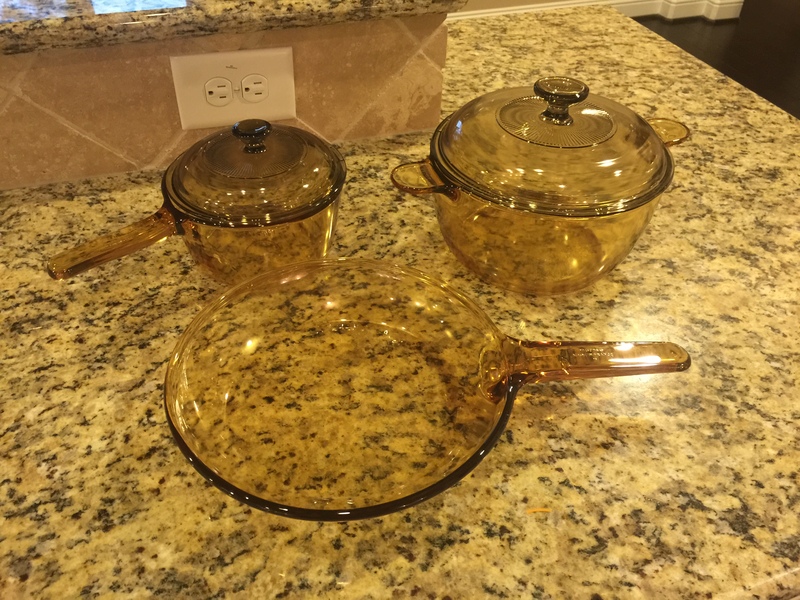 Join me in going vintage and let’s rock that Visions Cookware. Kenzie is a special girl who lives across the street. She has the appearance of a typical little girl, but when she opens her mouth, you quickly realize she is no ordinary girl. She is energetic, bright, bold, and can’t help but make her presence known. Please excuse OUR construction, or OUR Sunday School rooms. WE are growing!! This is OUR awesome Sunday School teacher. We love OUR children. We love OUR music. You get the picture. The truth is ownership makes things happen much quicker than diverting or the alternative.